Offering reassurance that you won't have to get all of Tuesday's election results by watching Wolf Blitzer And The Holograms totally outrageously traipse through the set of The Lawnmower Man, Comedy Central has confirmed that The Daily Show and The Colbert Report will go live on Election Night for the sixth time in a row. 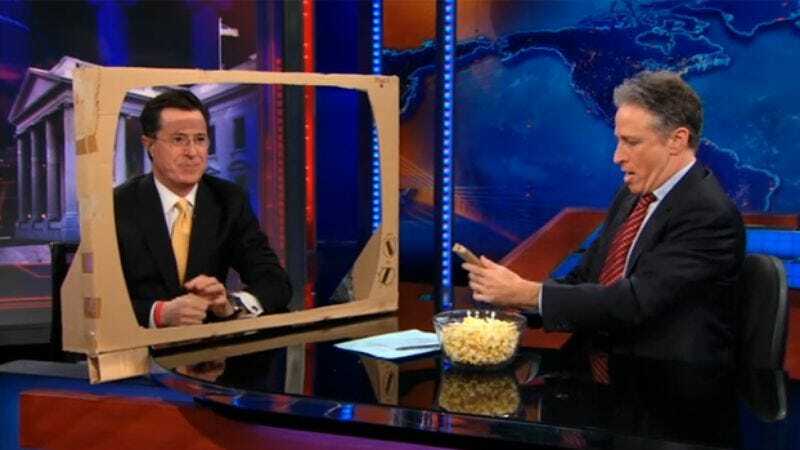 The Daily Show's Election Night 2012: This Ends Now begins at 11 p.m. ET with early results, analysis, and a palpable sense of relief, while Colbert goes on at 11:30 p.m. ET with guest Andrew Sullivan and the appropriately weighty title Election 2012: A Nation Votes, Ohio Decides; The Re-Presidenting Of America: Who Will Replace Obama? ’012!. And then neither show will ever discuss the presidential election ever again, just like the rest of us, under penalty of torture.